Peterson Pipe Notes is the overflow from The Peterson Pipe: The Story of Kapp & Peterson, a full-length (exhaustive?) 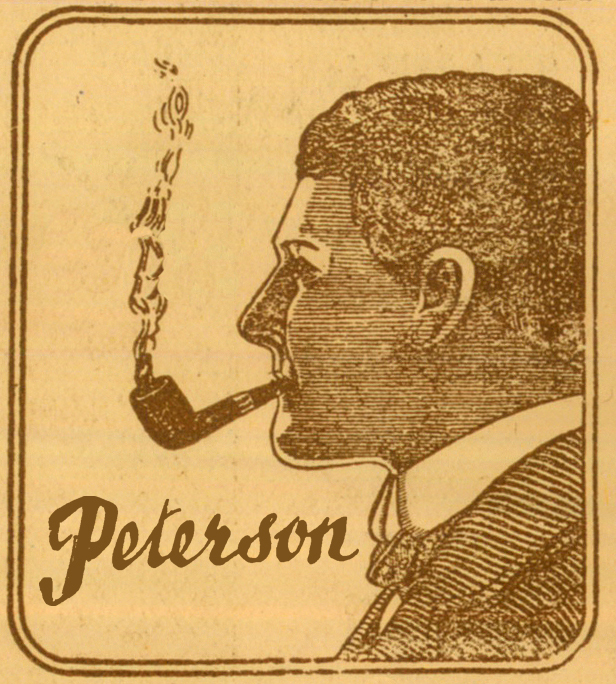 look at the history, pipes, and experience of Peterson of Dublin. Most of the blog is devoted to detailed information about Peterson shapes, lines and series–both visual and documentary that lie outside the scope of the book. None of it will find a direct place in the printed text, although the work here should be useful for two follow-up books. The Peterson Pipe is forthcoming from Briar Books Press, and I hope will be out toward the end of 2017. It will be presented in large format, full color, with sections devoted to the history, pipes and experience of Peterson of Dublin. I want to thank Tom Palmer (director) and Conor Palmer (commercial director) at Peterson, who have been extraordinary in their willingness to share news and the latest releases from Dublin for the blog. Thanks also to Tony Whelan, Jr., factory manager, who has answered more emails from me than anyone could expect, and all with grace and charm. My thanks also to everyone on the Blogroll who also contributed, most often in the use of their photography, but also in answering a host of questions. There’s some great Petes out there–just take a look. Whether your interest is in new or vintage Peterson pipes, by subscribing to the RSS Feed, you can receive email notifications and can read up on anything that catches your fancy. Enjoying your site Mark. Thanks for doing this. Question for you. I just picked up a Peterson Kapmeer bowl on ebay and it needs a stem. What kind of stem did it have? I know that they did not have always have p-lip stems but I am wondering about the stem shank junction. from the photos this one appears to have been a flush stem. Nice thick shank. Hi Steve. Kapmeer wasn’t the first meerschaum-lined briar Peterson made, but it was one of the most popular, appearing in 1968 and running until 1981, when it was discontinued. From 1968-1971 it used a standard tenon/mortise mouthpiece, in either F/T or P-Lip. But in 1972 Peterson began using an unusual “unifit” three-part mouthpiece. A “sleeve” was fitted into the mortise, then a “connector” onto the mouthpiece. Iwan Reis catalogs of the era used these on many of their Peterson lines. The Unifit was listed as late the Peterson-Glass 1980 pricelist, so odds are that’s the kind of pipe you’ve got. The illustrations don’t help much in the 1972 brochure, but I’d be glad to forward them to you if you think they’d help. Mr. Irwin, Ben Rapaport suggested I contact you with a question regarding bits. I tried the email address he provided, but it bounced back. Would you please, at your convenience, contact me at the address below. I recently bought a new 2013 Antique Set from Smokingpipes.com and both of my pipes have the (C in a chamfered square) for the silver date hallmark. If you have any other questions you can email my granddaughter Orla. She is doing the communications for me as I’m now 91 and the hands don’t work as they used to. This Wulf from Hamburg in Germany. I want to visit the Pipemaster grave here in my town somewhere. Can you or Grandaughter Orla help me with more information,please. Hi Wulf! I am forwarding your email to Sandra Bondarevska, Charles Peterson’s Latvian biographer. She has the street address and can give you directions. When you go, would you be so kind as to take a few photos & send them to me? I’d like to post them here on the blog at some point. I am trying to find a source for P-lip bits for Peterson Standard 306 pipes. Everyone seems to be out of stock. Pipe Makers Emporium is showing them in stock, but unbent–you’d have to bend them yourself. Did you try calling Smokingpipes or Cupojoes? Peterson will get one to you, but they usually like you to send the pipe so they can make sure it’s a good fit. Email them–they may be willing just to mail the right size to you. Sorry, Peterson’s will direct you to send the bowl to Howard Schulte, he is the U.S. authorized repair shop and he will not send out stems. PME and Tim West at JHLowe have various sizes of P-lip stems but they are rough and need to be sanded, bent and polished. I think they are like $8 each. I’m a bit slow with the uptake and only found this site today. I’m replying to this post as it relates to your book. I don’t know where to start reading but I’m certainly interested in the book. Is it available yet and if so, where can I find/order one? Hi Wikus! The book’s the slow thing, not you! We had no idea it would take so long. I’m working on layout & design just now, assigning illustrations to the text. At this point, I’ll be happy to see it out sometime in 2017. If you’ve subscribed to the RSS Feed, you’ll be in the loop concerning the publication schedule. one month ago i bought a wonderful peterson meerschaum patent from 1896 in perfect condition with the head of queen Viktoria . Since then i was searching the internet about more informations. perhaps if you like i can send you some pictures for your book? Or you have more informations about that pipe? Congratulations! I think Gary has already written you about this pipe; and yes, we’d love to use it in the book. I finished finished writing a whole new piece for the PETERSON BOOK tab that should give you an idea. … I’ll put it on the page as soon as I get home. I’ve got some illustrations to add this time. Hey Mark, just purchased an estate Kenmare 150 Bulldog from year 2000. It has the Aluminum premium P on the stem not hot foil was this common for the time period? Sorry couldn’t find email. On my smart phone. A gold-colored stamp was illustrated in the 2005 catalog. There has always been some variance in the mid to upper range in this regard. The Irish Whiskey rustics, for example, sometimes have a stamped gold logo, sometimes an embedded brass P.
A couple of months ago I purchased a Peterson pipe that had seen better days, but I couldn’t resist the look of it. It’s inscribed Peterson Aran 50S Made in the Republic of Ireland. It’s a rusticated sitter (I can send you a picture if you like). I tried finding information on the 50S but no such luck. I’m hoping you might know something. Any information would be appreciated! Hi Maurice, Your pipe is probably an 80s Aran. Try searching “Peterson 80s Aran smokingpipes.com” and see if you get an image that matches your pipe. Mark, I hope you know the answer to this question, otherwise it may be an inscrutable mystery ! I bought a Prince shaped Pre-Republic, a Kapet smooth 690. It is marked “Orawood” on the shank… ?! Do you have any idea what that means ? The folks at SmokingPipes.com hadn’t a clue. Any info would be greatly appreciated. Hi James! I can give you some information. Your pipe was made between about 1922 and 1945 or so. I can’t see whether the nickel band has a shamrock on it or not. If so, it was made for sale in the US by Rogers Imports, which dates it to 1938-1945 or so. The mouthpiece is a replacement. The original had an aluminum inner tube, and was probably a P-Lip. If the stamp reads ORAWOOD and not ORA [space] WOOD, then it was sold by a tobacconist of that name, as this practice was not widespread but common enough in all parts of the globe. There is no K&P line of that name that we know of, and as there is no Irish place named Orawood, this is further confirmation that the stamp was not made in the factory. The 600 shapes are represented in the 1937 catalog, but had disappeared by the 1945 catalog. Since there are no actual hallmarks, that fits with the American import. IRELAND” on the flat bottom of the shank. Given that, I’d guess it perhaps might be a hold-over bowl from your time period of ’37-’45 but not stamped and sold until ’48 or ’49 ?? Hmmm, dating these beauties is not an exact science, is it ? But many thanks for the suggestion about the tobacconist, that must be the answer ! And, to muddy the waters even more…that shape number looks more like “890” every time I look at it !? If any of this helps to refine your answer, many more thanks ! Actually what you said helps. Peterson did no hallmarking from 1938 -1968, so your pipe was made after 1938. Peterson used the MADE IN IRELAND in nearly every decade, so it is not a reliable dating guide. The 690 number had been discard by 1945 or so, so you’ve got an EIRE-era pipe, EIRE being 1938-1948, the shortest of all Peterson stamping eras. James, 900, 1000, 2000 shape groups from this era, but no 800 group that has been documented (yet). ..and of course, the 600 shape group. Remember the fella stamping this had the stamp on a vise, and sometimes the stamp or the stamper slip a bit, or don’t contact the surface fully. Thanks for sharing your expertise, Mark ! I know I’ll have more mysteries to solve in the future ! our name is Sansone Smoking store; and with the help of Mario Lubinski we are going on the market with the tirth edition of Peterson rogha! this is the one of last years; this eastern we have only 12 avaible; i would like to ask you if you are interessated to make a talk with us about this unseen peterson finish! Could I re-publish your blog the the Greater Kansas City Pipe Club newsletter. I would give you complete credit for the entry. Hi Dan! I would be honored. Send me the link (if it’s electronic) when you do. I’d love to see it. I just got a nice old System on eBay, and when it comes I will send a few pictures to pick your brain. In the meantime, can you give me an idea of when K & P ceased using their number-in-a-circle grading ? Thanks very much for sharing your knowledge with your fellow Kappnismologists ! Hi Mark, I have the pipe and pictures. As I suspected, no country of origin, and it also has a VERY large bowl. But I don’t know how to send the pics ! If I had an email, I’ve deleted it. Please advise. Steve Laug has sent me your direction. I recently found a Peterson Kapp-Royal Made in the Republic of Ireland with 79 stamped on it. The stem, instead of the Peterson “P” is stamped IRC. My assumption is that this is a Peterson Pipe made for and sold by Iwan Ries. This pipe has beads carved around the ferrule similar to the Dunmore series. What would your guess be on what I have? Hi Joe, I’m sending you a catalog illustration of the IRC line, but in the meantime, let me say “Congrats!” You’ve got the very earliest version of this very cool Premier-quality unmounted System line (as well as the 79 / 309 being my all-time favorite shape). It appeared in IRC catalogs from 1969 – 1979 as the “Dunmoor.” Send me a photo if you can. More in my email to you! Let me try again. I missed it by 2 years. Actually the first appearance of the “Dunmoor” as IRC always called the line, was in 1971. If you’ve got an email address, I can send you the relevant pages. The line was so successful for them that Peterson eventually issued it worldwide in 1978. It ran as a line until about 1984. It was a special unmounted System line of Premier-quality briar catering to all who thought the nickel and sterling mounts old-fashioned. If you’re into old Petes, subscribe to PetersonPipeNotes.Com—I’ll be doing a series on the IRC-Peterson collaboration from 1969-1979 later this year. P.S. If you have photos, love to see your pipe—esp. with the IRC stamps! About what year did Peterson stop using the faux hallmarks on their nickel bands ? I think that’s a good, general handy dating tool to know. Forgive me if you’ve covered it elsewhere, I searched but didn’t see it. It’s in the book! LOL. The date the old factory hands gave us is c. 1963, when the silver-soldered, hand-made nickel ferrules were replaced with pressed-cap ones. More info (and pix) in the book! Thank you, sir ! The question came to my mind via a Facebook post. That is indeed a useful dating clue. Glad to help. More info on dating–loads and loads–in the book. 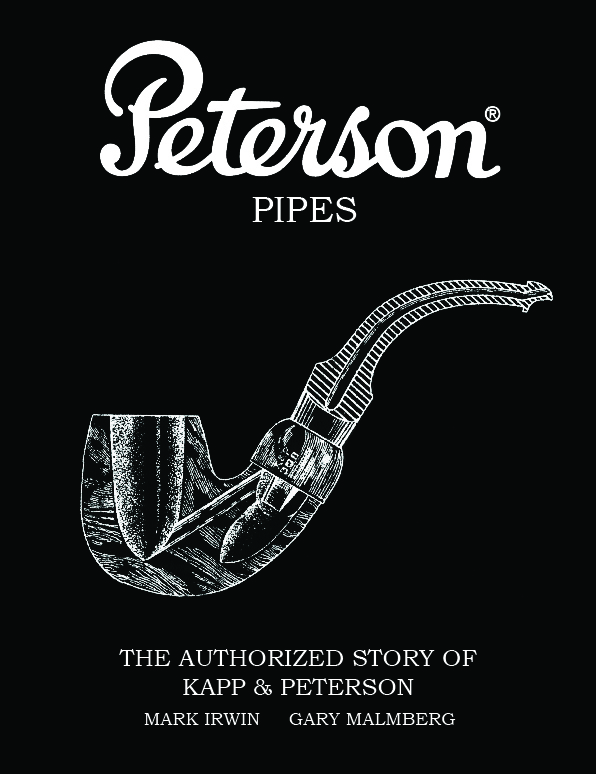 Mark are Mark twain’s Personal Peterson pipes covered in the book?Is there still any Peterson straight billiard pipes with heel bowls in existence?I think Mark Twain owned one. Hi Paul, First question: yes, but only insofar as the Mark Twain commemorative is concerned, which has extensive coverage of every issue, as it is Peterson’s most important commemorative. We had MT collector Anthony Macaluso work up a great side bar, which I then supplemented and expanded. But aside from several photos of Clemens smoking the Peterson 14B (which was used as the inspiration for the homage pipe), no. If you have any documentary information concerning his personal Petes, I would love to hear it and see it and post it here on the blog. Second question: I’m sure there are, somewhere, but neither my co-author Gary Malmberg nor myself has ever documented one. Hi Mark, is there a way to differentiate the “Made in Ireland” block letters stamp from the end of the patent era (1916) vs those made just before the republic era (1947)? Trying to determine the age of a nickle band 338 I have. It has the fork tailed P.
Hi Mike! Sounds like you’ve done your homework already, since you know the MADE IN IRELAND did not appear until the end of the Patenta era in 1916 or so. We looked at all 3 of the MADE IN IRELAND stamps in Sallynoggin in 2013, and you’ll see photos of them in the book. I am away from at a funeral & can’t look to see when the 338 first appeared. I know it’s in the 1947 shape chart, and maybe, maybe the 1937 catalog. You’ve probably read about it in the blog post on the “Dutch Bent” shape–if not, take a look. I will add that the MADE IN IRELAND in a cirlce seems more characteristic of US-only Rogers-Imports era pipes from the very late 1940s and 1950s, while the block lined stamps seem more typical of IFS and Eire eras. If it doesn’t have an IFS or EIRE stamp, I think it is more probable that it was made in the Early Republic era. Send me a photo: mark@afinemess.org. Sometimes the nickel marks and other characteristics can help with dating. Good Day Mark , Can you tell me anything about those bog-oak pipes made during the ’emergency’, as it was referred to in Ireland or WW2 1939-45 (to the rest of us)? I have been unable to buy a copy of ‘the book’ yet, or I would look for myself. Hi Richard, yes I can. The book won’t be out for a month or two, but until then, what you’ve got is a very, very rare Pete documented only in the 1906 catalog, described exactly as you say. There’s no indication that these were made beyond the 1910s in any of the documented pipes we’ve examined or Peterson catalogs. We’d all love to see photographs of your pipe!